Photographed tonight -- the "Ramat Gilad" settlement outpost. The Ramat Gilad outpost in the Northern Hills of the Shomron/West Bank is named in memory of Gilad Zar, who was murdered by Palestinian Terrorists, 8 years ago today. 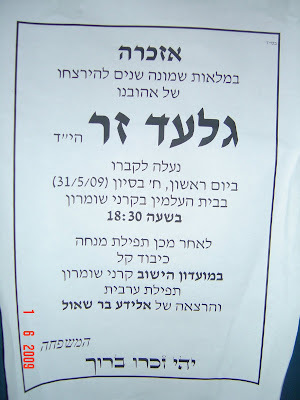 The flier below appeared throughout Israel, calling on people to attend a memorial service this afternoon for Gilad Zar, the Security Commanding Officer of the Shomron Region of the West Bank. On a normal day, the view from Ramat Gilad is simply stunning, as you can easily see the Mediterranean Sea to the West, and the hills surrounding Shechem/Nablus to the East. Tonight however, Israel caved into to US pressure, and set in motion the demolition orders for the Ramat Gilad outpost. Despite the land's legal purchase by Gilad Zar's father more than 30 years ago and the approval and registration of the sale by the Military Command and Civil Administration, the Minister of Defense refuses to put his final signature on the document -- in order to deep the outpost, "illegal." Moshe Zar shows the approved maps, authorized by the IDF regional commander and IDF civil administration -- dating back at least 20 years. The map is already officially parcelized into building lots by the civil administration, yet because Israel's Defense Minister Ehud Barak refuses to add his final signature for "political reasons", he is trying appease US President Obama and the Labor party voters by using the police to crush a settlement outpost of 10 families. Tonight, hundreds of the outpost's sympathizers came to it's aid -- from Tel Aviv to Hevron, to send a clear message to US President Obama: The Land of Israel will not be Judenrein. Organizers review their options while waiting to see what Defense Minister Barak has in store for them. 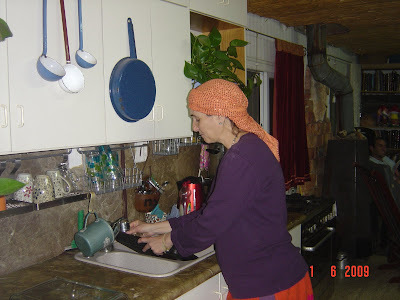 Michal Shoham, sister of Gilad Zar in her home on the Ramat Gilad outpost. 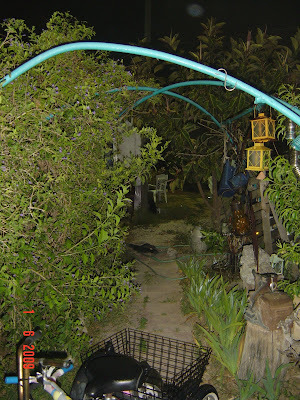 The garden outside the Shoham's home. As of 3 AM, it appears the the hundreds of volunteers have managed to push off the outpost demolition orders. Tomorrow's another day...as the residents of the Ramat Gilad outpost fight for their right to live as Jews, in the Biblical Land of Israel. I agree 1000% to take a stand AGAINST the arrogant policies to strip Jews from their Land, the Land that Hashem gave to Avraham, Yitzhak, Yaakov, and their descendants. Who does that usurper think he is? Pharoah? I wish I was there to stand along side those brave yidden. 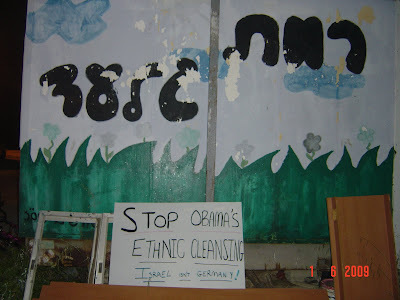 I am waiting for an Israeli politician or journalist to ask Obama one simple question - why can arabs live and be citizens of Israel and yet Jews cannot live in areas controlled by Arabs (i.e. Palestinians). Its up to Jews to take a stand like their ancestors did. When its legally bought land and the government wants to demolish property on it without compensation, it is pillage and theft. And it has no right to do this at the behest of a foreign government! Arabs are not allowed to purchase houses and live in Jewish yishuvim. That makes the yishuvim "Arab-rein." Is that acceptable, in your eyes? If so, why? No identification of MT? What, he's also incognito? To assert that settlements are "an obstacle to peace", is to accept as a premise that the Arabs cannot live with Jews. The real issue here is the Arab failure to accept peaceful co-existence with Jews ...that's the obstacle to peace, not "settlements". Well if they convert to Judaism they would be allowed. Is that acceptable, in your eyes? If so, why?Actually, thats total BS. In the settlement of Karnei Shomron which is beneath the Ramat Gilad outpost there ARE Arabs living there. Additionally, the Supreme Court ruled that Arabs can live anywhere they want in Israel. Its only a "provocation" for the Jews to live where they want. You must be lying Jamil. I never heard of such a thing. Next you will say he served in the Israel Occupation Forces. You must be lying Jamil. I never heard of such a thing. Next you will say he served in the Israel Occupation Forces.Guess what? He did. I think you mean the Israel DEFENSE Forces. I hear he is trying out for his local Kitat Konninut (Rapid Response CTU), so he can help stop Arab terrorists who try to infiltrate his Yishuv and home. Didn't we do this Arab previously? Anyway, how many Arabs live in kibbutzim? And if none, does that disqualify their right to exist? actually abu ala (ahmed queria) has said that the settler jews who wish to remain in the future palestine can, as long as they dont mind living under palestinian rule. Tell me settlers can you live in Palestine? Or do you just want to steal land for Israel. If living in ancient lands is so important to you, I dont see a reason why you cant live under Palestinian rule. Albert, pssst. Arabs can hardly live under Pal. rule. You expect Jews to succeed? Maybe they'll let a Jew own property and run for President of the PA! Oh, wait. In the PA it is illegal to sell land to a Jew. The punishment for doing so is death. I guess they won't let them run for government either. Does Albert even know this? First, a question of semantics. Gilad Zar, I understand, was a military man, in the West Bank, and was killed while in service. You refer to the people who killed him as 'terrorists' - a term normally reserved for people conducting violent actions against civilians. So when are Palestinians okay in your eyes? And, more interestingly - a response to that would be particularly appreciated - would you also deem Israelis killing Palestinian military personnel as 'terrorists'? how about those killing Palestinian civilians? Anyways. To your post's main point. You're upset that an illegal outpost is being removed - despite knowing that it's illegal, not only under international law but under Israeli legislation as well. And we both know that they'll take those caravans, park them on some other confiscated Palestinian land, until the media interest cools down, then put them back up. So what's the fuss really? We both know your government is as keen on occupying land as you are! You should just keep a low profile and weather the storm -which is barely a breeze, really - for a little while. A final point, regarding your comment that "the Supreme Court ruled that Arabs can live anywhere they want in Israel.". The West Bank isn't in Israel, remember? And don't go all "God-the-realter-gave-it" on me - let's stick to facts, and law. The judgment you're talking about doesn't concern settlements. In fact, Arabs approaching settlements are often shot on sight. You teach your children to throw stones at them. You walk around with loaded weapons, nearly waiting for a chance to use them. "Arabs can live anywhere?" Where do you come making such a claim? That's ridiculous. I'm quite alright with Jews living in the West Bank, if, as a self-declared right-wing Jewish friend of mine suggests, they're willing to take Palestinian citizenship or residency. Until then, settlers will remain illegal squatters. "First, a question of semantics. Gilad Zar, I understand, was a military man..."
a security officer of the Regional Council assigned to protect Jewish lives and property from evil persons. "and was killed while in service. You refer to the people who killed him as 'terrorists' - a term normally reserved for people conducting violent actions against civilians"
he was a civilian, killed in an ambush. you can perversely call them whatever, even 'freedom fighters' but they were cowardly terrorists trying to take away Jewish rights in their national homeland just like their fathers and grandfathers since oh 1920 or so. "So when are Palestinians okay in your eyes? " when they are peaceful and either citizens of the Jewish state between the sea and the river or citizens of Jordan and residents of Israel. Americans do that well in France and Brits do it well in Spain. "would you also deem Israelis killing Palestinian military personnel as 'terrorists'? how about those killing Palestinian civilians?" no. Pal. police (they have no 'military' and if they do, that's illegal) are police. "You're upset that an illegal outpost is being removed - despite knowing that it's illegal"
but it's not. it is simply that the full land registration and zoning processes have not been completed. if it's stolen, then it's illegal. otherwise, I prefer "unapproved". "park them on some other confiscated Palestinian land"
if private Arab (there's no such thing as "Palestinian" in a geo-political sense; historically and scientifically as in archeologyu, yes but not politically) is stolen, I'd give it back. 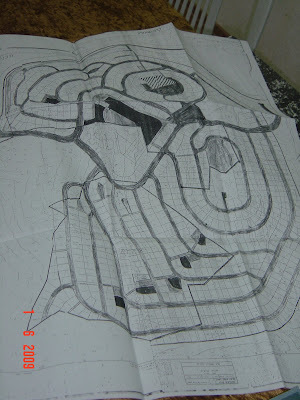 "A final point, regarding your comment that "the Supreme Court ruled that Arabs can live anywhere they want in Israel.". The West Bank isn't in Israel, remember? And don't go all "God-the-realter-gave-it" on me - let's stick to facts, and law." Nope. Judea and Samaria (sorry, I use Bank Leumi; which bank is the West Bank?) was part of the to-be reconstituted Jewish national home be international legal decisions in 1919 (Versailles), 1920 (San Remo), 1922 & 1923 (League of Nations) which stipulated the right of close settlement on all the land between the sea and river after awarding a Saudi Arabian refugee named Abdallah ibn-Ali. The term "Arabs" was not mentioned, only "non-Jews" because Arab rights were in Jordan, Iraq, Lebanon, etc. "Palestine" was for the Jews. Gilad Zar, I understand, was a military man, in the West Bank, and was killed while in service. His position was "security officer" responsible for Defensive security. His job was not in an IDF capacity. While he was driving on patrol, he was murdered by Palestinian terrorists (employed as policemen by the Palestinian Authority). They killed him in a blatant act of terror. Unprovoked, except of course for those who can't stand seeing Jews. You refer to the people who killed him as 'terrorists' - a term normally reserved for people conducting violent actions against civilians. Terrorism is not reserved exclusively for attacks against civilians. So when are Palestinians okay in your eyes? When they aren't involved in acts of terror. And, more interestingly - a response to that would be particularly appreciated - would you also deem Israelis killing Palestinian military personnel as 'terrorists'? Just last week in Kalkilya, "Palestinian Military Personnel" opened fire on 2 IDF soliders. They returned fire and seriously wounded him. how about those killing Palestinian civilians?Palestinians who kill Palestinian civilians are also terrorists. In fact, Arabs approaching settlements are often shot on sight. Really? What alternate reality do you live in? Many Arabs work in settlements...so how exactly are they shot on sight when they approach the settlement? You teach your children to throw stones at them. My children will say otherwise. You walk around with loaded weapons, nearly waiting for a chance to use them. Yes, I walk around with a loaded weapon. I'm always ready to use it -- otherwise, whats the point of carrying a weapon? For show? "Arabs can live anywhere?" Where do you come making such a claim? That's ridiculous.Really? There are arabs living in my settlement. They dont publicize it, because they dont want their families to get harassed by other Arabs. I'm quite alright with Jews living in the West Bank, if, as a self-declared right-wing Jewish friend of mine suggests, they're willing to take Palestinian citizenship or residency.I have a question for you: Why do you think that Israeli Arabs who live in Taiba, Tira, Um El Fahm, and other Israeli Arab towns in Israel -- adamantly refuse any suggestion to be annexed to a "future Palestinian State"? Interesting responses, appreciated. 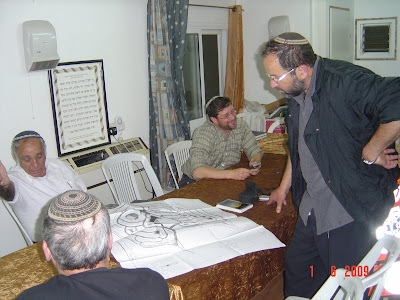 I am very curious about the settlers' thoughts - while I generally disagree, I try my best to listen from the source. My question was inaccurate. Allow me to rephrase: when are Palestinians allowed to defend themselves against attacks conducted by the Israeli army - or settlers? And are Israeli civilians who kill Palestinians terrorists? YMedad:You purposefully make demagogic statements that serve nothing to advance this discussion. I'll avoid going on the 'since the 1920s' and 'there is no such thing as Palestinian'. But there are a number of interesting points you make, and I'd be keen on knowing what you think. "(Palestinians) as citizens of the Jewish state between the sea and the river or citizens"So you advocate a 1-state solution, with Israel absorbing the Yesha? and give citizenship to all Palestinians in the West Bank and Gaza? Outposts are illegal - not unregistered: illegal - even under Israeli law. Say, does settler ideology supersede national legislation? I understand that there occasionally are clashes between what settlers believe, and what the government says. So who has the right, according to settlers -- I suppose you are one? -- to decide against the State? Regarding M. Zar -- an armed guard? Hardly a civilian. Even Jameel seems to agree. Oh, and good one about Bank Leumi. Jameel @ the muqata:Interesting name you picked there! What's the story behind that? So Mr. Zar was walking/driving around, in the Palestinian territories - sorry, in Judea? - with a loaded weapon, looking for a suspect or a target. That's not a provocation - that's several provocations. Alright, a question then. Naive as it may sound, but the settlers' perspective isn't one I'm very tuned into: I'm curious. Do settlers realise that their mere presence in the West Bank is provocative to Palestinians? I'm aware that Arabs work in settlements. A very sad fact of realpolitik. You cannot, however, deny the numerous incidents of Palestinians being shot at - especially at night - because they happened to walk past a settlement. As for Arabs living on settlements - ha, interesting! And doubtful. 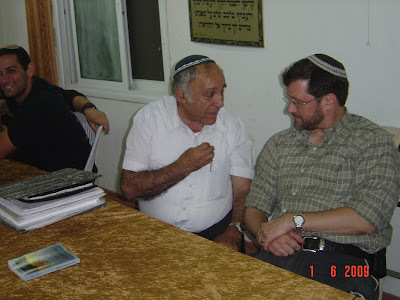 Unless it's the yishuv's handyman (and maybe his family)..
Actually Mr. Zar’s provocation was his good relationship with the local Arabs who were selling him thousands of dunams of land in Judea and Samaria. So yes, he was a provocation to the Palestinian Authority who murdered him – and not because he was armed to defend Jews against exactly such terror attacks. Yes, the Jews in Hebron, who lived in Hebron, uninterrupted for 3000 years until 1929 (and long before the Arabs showed arrived) learned that their presence was a provocation to the Arabs. Are you actually so ignorant to not know that Jews have ALSO been living in Israel for the past 2000 (and 3000 years)? How many guesses will you need to figure out where the Jerusalem Talmud was written? Of course we are aware they claim it. They also claim the entire Land of Israel. Nothing new there. If you combined the claims of all the “Palestinians” as to how many dunams of land their grandfathers owned and lost, “Palestine” would be about the size of California. Maybe they'll claim next that they are an ancient and proud people. Do you not recognize the right of Jews to buy land in Judea and Samaria? I'm aware that Arabs work in settlements. A very sad fact of realpolitik. Really?! Because we call it cooperation, coexistence, and a mutually beneficial relationship. You cannot, however, deny the numerous incidents of Palestinians being shot at - especially at night - because they happened to walk past a settlement. Actually I can. And more so, I can point out the numerous instances of Palestinians trying to walk INTO settlements at night, and not through the front gate. As for Arabs living on settlements - ha, interesting! And doubtful. Unless it's the yishuv's handyman (and maybe his family). WOW! Can you possibly be any more racist than that? I bet you also don't know there are Arabs who serve in the IDF and are even Members of the Knesset. Right. Lies and nonsense. So you know your Yisrael Beitenu talking points, good for you! But if you're unwilling to answer my questions or contribute with something useful, do the world a favour and keep your tongue in your mouth and your fingers away from your keyboard. Now, again. Does anyone have answers to my questions -- above -- or are settler ideas secret? Poor boobie. Didn't like the truth. Truth? You're so deep into an ideological delirium that you forgot what truth sounds like. I could debunk every word you say but that's not my case right now. So if you're that smart then, answer my questions! - when are Palestinians allowed to defend themselves against attacks conducted by the Israeli army - or settlers? - And are Israeli civilians who kill Palestinians terrorists? - If you believe in Israel from the sea to the river - will the Palestinians become citizens too? - Do settlers realise that their mere presence in the West Bank is provocative to Palestinians? Because if you cannot answer, or just come back with another smartass comment, it will be proof that you have no ideology and are just in the West Bank for the cheap housing. I could debunk every word you say but that's not my case right now. - So you're saying that any violence inflicted on Palestinians by the Israeli army or settlers is deserved?? But we both know there are events of unprovoked violence on the part of the army and settlers. Farmers are routinely attacked in their fields, for instance. In such case, are they allowed to defend themselves? - No, I wasn't missing a word. If it wasn't clear, my question was 'Are Israeli civilians who kill Palestinians considered to be terrorists?'. - Do you realise that if you give citizenship to all Palestinians in the 'larger' Israel (sea to the river), they're likely to become a majority pretty soon. How does that work with the State being Jewish AND democratic? So you're saying that any violence inflicted on Palestinians by the Israeli army or settlers is deserved?? Are you saying that Palestinian violence against settlers and the IDF is justified and deserved?? But we both know there are events of unprovoked violence on the part of the army and settlers. We all know that the vast majority of violence by Palestinians is unprovoked. I drive on the roads and there are rock and molotov cocktail throwings against Jewish motorists on a daily basis. Just read the papers -- every single day there are rock attacks by Palestinians against Jewish motorists. Do you justify these unprovoked attacks? Farmers are routinely attacked in their fields, for instance. In such case, are they allowed to defend themselves? Since I'm routinely attack when I drive on the road, am I allowed to defend myself? Guess what? If I dare shoot at a unprovoked Palestinian rock thrower, I am immediately arrested and my gun confiscated. The best possible outcome is what happened a few months ago -- when a innocent, violent, Palestinian rock thrower was killed by his own rock. It bounced off a Jewish motorists car tire, rebounded, and hit him in the head. The Jewish driver was immediately apprehended on suspicion of shooting the rock thrower -- however, the autopsy showed he was killed by his own rock. Do you think the motorist should be guilty for his car tire having been indirectly responsible for the rock thrower's death? No, I wasn't missing a word. If it wasn't clear, my question was 'Are Israeli civilians who kill Palestinians considered to be terrorists?'. If the Palestinians they killed were involved in violent attacks against Israelis, then no, the Israeli civilians aren't terrorists. However, if a group of Israelis are ideologically bent on killing non-violent Palestinian civilians, and do so as an organized group, then yes, that is terrorist activity. Do you realise that if you give citizenship to all Palestinians in the 'larger' Israel (sea to the river), they're likely to become a majority pretty soon. How does that work with the State being Jewish AND democratic? Since there's only 1 Jewish state, (vs 23 Arab States) the Jewish State cannot be 100% democratic. Palestinians deserve civil rights, and local municipal/regional rights, but the ultimate character of Israel must remain Jewish. Good.. we're starting to have what vaguely resembles a conversation.. great! And what legal status do the Palestinians have, citizens? residents? But what is that 23 Arab states argument about? (btw, there are 22 Arab States, if you're also counting Palestine). Because they share ethnic characteristics with the inhabitants of a neighbouring country, they should go there? Like "hey, there are plenty of white english speakers around the world, so we should empty Britain of its white english speaking inhabitants, send them to NZ, and leave it for the Tamil people?" Do you realise how incongruous this argument is? And, Jameel, why do you answer most of my questions by other questions? Why can you not simply answer them? Are the Palestinians who are routinely attacked, while picking their olives for instance, allowed to defend themselves? Do you consider violence inflicted against the Palestinians by the army or the settlers to be deserved? Do you acknowledge that there is unprovoked settler and IDF violence against Palestinians? And why can you not simply answer them? Anonymous - unless you have something useful or interesting to contribute to the nascent conversation, please bugger off. If you want to pick a fight, bother someone else. I am actually interested in hearing (well, reading) the response from a settler point of view, rather than rely on secondhand sources. YMedad and Jameel seem to understand the importance of clarifying their PoV to people like myself who don't share it, and it is they, and people like them, that I am reaching for. a) no. I don't. demographics are working in our favor. b) if you are right, though (which you are not), what about inside pre-67 Israel. same thing, no? so all ,y Leftist friends are in trouble? c) I won't allow persons to become citizens and vote if they are subversive. Israel is the jewish national home, the Zionist/Democrtic state. If Pals. want to become citizens, they are can't use that to destroy Israel from within. You just seem to be basing your questions on bad info, and when the underlying premise of your question (and other facts) seem to get in the way of that, you just try to wish them away with your 'bugger off' remarks. Mo, do you enjoy it when you beat your wife? (and remember, you can only answer yes or no). Anonymous: still not adding anything constructive. So, once again, bugger off. Orange&Black - What answer are you hoping for -- "yes, all 11 of them"? You do realise that you're just trolling now, aren't you? Can someone put those children in bed and send in the adults for a conversation? You're the one trolling for the answers you want to hear. That didn't make any sense, Anon. Trolling involves disrupting a conversation, which is what you're doing, hiding behind your anonymity. And there are no 'answers I want to hear'. All I want is answers. Too complex for you? When are Palestinians allowed to defend themselves against attacks conducted by the Israeli army - or settlers? Your question is worded too poorly because answering it implies guilt. When are Palestinians allowed to defend themselves against attacks by the French Police? What "attacks" are you referring to? Are you claiming the IDF attacks Palestinians for fun and profit? What "settler" attacks are you referring to? No one's allowed to take the law into their own hands. The law permits use of a weapon for self-defense. The IDF has counter-terror units, comprised of civilians who neutralize terrorists which threaten lives. The concept of "Greater Israel" goes from much farther than the sea to the river. As I've written before, I envision autonomy for Palestinians, but total citizenship because it could threaten the Jewish character of the State. Actually, no. I had no idea my mere presence was a provocation. Is a the Jewish State in the center of the Middle East a provocation as well? Let me be straight, Mo, and I won't skirt the issue which others are doing consciously or unconcisouly. 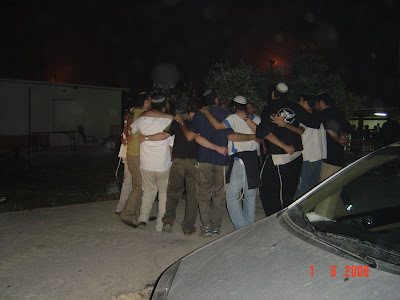 Yes, there have been criminal and illegal attacks by Jews, some of the them Jewish residents in the Jewish communities in Judea and Samaria who have taken the law into their own hands. I will not get into an argument now vis-a-vis the Israel government and what led to these attacks. However, in over 90% of the cases, police action was taken (I am aware of B'tselm's data), and there were arrests and trials and incarceration. And recently, unruly mobs of youngsters even set afire fields belonging to Arabs. These acts are condemned bu all the leading personalities and state authorities - unlike what goes on in the Arab society. Some do make mistakes, and there are some who try to justify unprovoked violence which, in my opinion, leads nowhere. In those cases, citizens or those under military governship, should try to protect their property and lives. And Jewish Rabbis, educatorsd and politicians should attempt and hopefully succeed in calming things down and making sure nothing gets out of hand. I am planning of responding a little more at length later today but until i do, I thank you both for your responses. Well, I think they would be allowed to defend themselves from the French police, if the french police attacked for no reason. And yes, aside from the fact that they shouldn't be there - but that's another story - most attacks and transgressions by the IDF are unjustified. The way people are made to kneel down on the road at a checkpoint. The tall buildings that the IDF confiscates to use as an observation point. Their insistence to go through the wall of one apartment to get into the next one (which i fail to see a remote justification for). etc. I'm afraid we both know that settlers taking the law into their own hands is not a rare event. - "As I've written before, I envision autonomy for Palestinians, but total citizenship"
Well, it is, because the land of the settlement belongs to someone or someone's family, and it is their resources that are forsaken everyday. And given that those settlements grow daily, with increasingly youth setting up camp on hilltops and calling it a settlement - actually not unlike the one referenced in your post above - you're not even giving the Palestinians the chance to make their peace with that loss - you add to it. "The concept of "Greater Israel" goes from much farther than the sea to the river." I thought Israel+Yesha was the concept of greater Israel in settler terminology -- my bad. Then what is it? And, the very most important question -- what's the story behind your unusual username? "I won't skirt the issue which others are doing consciously or unconcisouly." I highly doubt this 90% of cases statistic you mention, first because most cases aren't reported (says HR orgs, not me); and second, quite often the military will refuse to take the deposition of the Palestinian, or will do nothing, or will actually arrest the Palestinian who was filing the report. Or, when the issue cannot be contained - if the incident was filmed, for example, as has been the case a few times - the Army will harass the victim's family. I'm interested that you used "set afire fields belonging to Arabs." Am I to understand that you recognise the 'ownership' of Palestinians in the West Bank? Some? Where do you draw the line, what is yours, what is theirs, what is yours to confiscate for a settlement? Interesting conversation, gentlemen, I thank you. "I'm interested that you used "set afire fields belonging to Arabs." Am I to understand that you recognise the 'ownership' of Palestinians in the West Bank? Some? Where do you draw the line, what is yours, what is theirs, what is yours to confiscate for a settlement?" I guess who haven't read Jabotinsky, notably the Iron Wall, try here. Even Rav Tzvi Yehuda Kook (the son) said, "our fight is not with Ahmed or Mustaffa" that is, there is private property belonging to Arabs here which Jews need protect and honor while he opposed the concept of an Arab national group that had general rights in the Land of Israel. The aborigines were the Jews. במאמר כללי יותר שבו הרצי"ה מבחין בין זכויות פרטיות לזכויות לאומיות של הערבים: "יש להבחין בין זכויות פרטיות לבין זכיויות לאומיות. ערבי שיש לו בעלות על בית, אינך רשאי, מבחינה מוסרית, לנשלו מביתו, כי זה רכושו הפרטי ואסור לגנוב גם מגויים. רבנו הרב צבי יהודה התבטא פעם: אין לנו עסק עם אחמד ומוסטפה, עלינו לדון רק מהאספקט הלאומי – הארץ הזו היא שלנו, ועל כך אין אפשרות לפשרה" (הרב שלמה אבינר, שאילת שלמה, ירושלים תשס"א,, חלק ד, סימן נה). Mo: most attacks and transgressions by the IDF are unjustified. We can't really continue this conversation when you provide inflammatory, incorrect facts. "Most" attacks? Is this based on your own observations? The observations of people who are avowedly anti-Zionist? The way people are made to kneel down on the road at a checkpoint. Do you think the IDF does this for fun? Have you ever seen a suicide bombing? Have you ever seen teenagers or women with bombs strapped to themselves? Guess what? That's REALITY. And if the only way to safely ensure that suspects are not going to blow themselves to bits, is to get them to kneel down, then that's what needs to be done. The tall buildings that the IDF confiscates to use as an observation point. Observation point for...? What are they observing? The scenic nature of downtown Nablus? Besides, the IDF does have a system of compensation for using a house. Their insistence to go through the wall of one apartment to get into the next one (which i fail to see a remote justification for). etc. Obviously, you have never been in combat before. The IDF doesn't do this for fun -- its done as a measure (usually when there are firefights going on at the street), as a way of safely going from house to house to get to terrorists. No, its not wonderful. War is hell. Why don't I like BTselem? Because they live in a vacuum, and don't care about Palestinian violence against Jews. A day doesn't go by without extreme violence against Jews by Palestinians -- from rocks thrown at Jewish cars on highways, to firebombs, to shooting attacks, to terror attacks with guns and knives. Statistically comparing Palestinian violence to that of "settlers taking the law into their own hands", its about 99 to 1. Any person that indiscriminately damages someone elses property is wrong and should be punished by law. Unfortunately, Palestinians have zero problem with throwing rocks, bombs, etc at settlers on a daily basis, and they are encourages to do so by the anti-Israel education they receive in school. Why do you think that this land (and my settlement) are built on land stolen from Palestinians? My settlement was build on barren, state-governed land. Ramat Gilad was purchased legally from Palestinians. Why is it so difficult for you to understand that land can be legally purchased and settled? 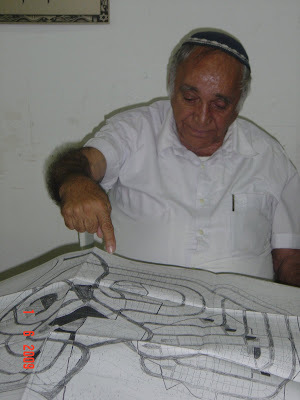 So Rav Kook admits to Palestinian ownership. Very well. But where do you draw the line? What part of their private ownership is 'confiscable' for, for instance, the expansion of a settlement or the creation of a new one? I hesitate to respond to all your points because I fear we're getting sidetracked into what will rapidly degenerate into a shouting match, which would be a pity. So I'll try to limit my responses to those, and focus on the most interesting points. Yes, actually, the IDF does a lot of sh*t for no good reason. Keeping people stuck at a checkpoint for hours - or kneeling in the sun with the hands above their heads for an hour serves no security purpose whatsoever. Don't kid yourself. Compensation? False. The family is lucky if they get their house in one piece after the army leaves. They raid a house, lock the family in a room (or in a floor) and take over the house, wreck the furniture. The family is barely allowed to go in or out. Or use the bathroom. It's completely ridiculous. 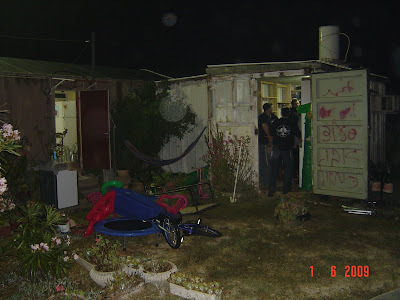 "Breaking the silence" has a lot of IDF testimonies about night raids and such attacks that are meant, to quote one of the soldiers, "to show the Palestinians who's the boss". "as a measure (usually when there are firefights going on at the street)" Again, incorrect. Of course you can claim that anything is 'as a security measure'. That's an easy way out. Also, they also do that going from apartment to the next - when the doors are actually inside the building, so they're not exposed to the hypothetical fighting you speak of. On B'Tselem: "they live in a vacuum, and don't care about Palestinian violence against Jews"
Does that make what they report any less true? Barren, state-governed land? Which state is that, the Israeli? Well they have no ownership over it in the first place. Come on now, it's a cyclical argument. It's Israeli land --> we can build --> it's Israeli land. "Statistically comparing Palestinian violence to that of "settlers taking the law into their own hands", its about 99 to 1". Have a source for this statistic? And what happens when you include IDF+settler violence to compare with Palestinian violence, how does the statistic look? thats a law on the PA books. Also, a source for that? Here's the quickest source I found for the law that I mentioned. Wikipedia: Palestine Land Law"
Who owned the land before 1967? Settlements, as opposed to Tel Aviv or peace-loving leftist Kibbuztim, are not based on building on Palestinian villages, nor are they built on land owned by private land owners. Before 1967, Jordan occupied the West Bank. Lands which were not privately owned, were owned by Jordan. When Jordan attacked Israel in 1967, Israel fought back and won. The lands that settlements are built on, are primarily "public" state lands, which used to be owned by Jordan. a) all throughout the centuries, during Roman rule until 330, Byzantine rule until 614, Persian rule until 638, Arab rule until 1099, Crusader rule until 1260, Mameluk until 1516, Ottoman until 1917 and British until 1948, Jews actually lived in the country and immigrated to it and maintained a presence despite no independent self-adminsitration of a political character. b) there were Jewish graves all over the place which meant that - lo and behold! - Jews not only lived there but died there and were brought ther also to be buried. amazing, eh? c) as for private property, and you'll find this hard to believe, but continuing my opening sentence, the local Arabs around Shiloh appealed to courts and were told to bring documents, tax records or any other indication they used the land. P'liah Albeck from the Justice Ministry in the 1980 used to fly out by heliocopter to spot plantings (and ever since, Arabs have been planting were they don't own and the youngness of the trees are evidence) or walk around seeking out goat droppings as another sign of Arab use. But if they couldn't prove it, or there were no pictures, etc., certain lands were appropriated in accordance with the League of Nations decision that state lands were to be used for Jewish close settlement - the actual words, Mo. Medad and Jameel - you guys are clueless. You aren't having a discussion with this guy, because he isn't about to allow you to confuse him with facts or reality. His head is filled with PA propaganda which he is mindlessly spewing back at you. Anything you say is hypothetical or alleged, while his nonsense is fact. Stop wasting your time and start writing about Srugim. Dear Obe Kno, oops, wrong film. That's an interesting and quite silly law indeed. This said, it has never been applied - not once. It's clearly a rather silly way of making a loud statement..
That Jordan administered the WB doesn't mean they 'owned it'. You're stuck in a colonialist logic - I'm referring to the ideology of a couple of centuries back, when what was conquered (and, for instance, what came out of Mexico's mines) was considered property of the colonising state (Spain, to continue on the same example). But it's easy to go through the 'there used be little property in mandate Palestine' argument when there was really not much such property in any of colony. Property rights, land titling, and all that came to life in many such countries around the era of decolonisation (50s, 60s), the same era that the WB changed hands from British to Jordanian to Israeli hands. As such, your argument is reduced to 'it's our private property because we (or our government) registered it first'. Which, even if it were historically correct, would fail the test of morality. And regarding 'Tel-Aviv or peace-loving leftist kibbutzim' as you write, I am well aware that they are built over the ruins of Arab villages. But circumstances have made it such that Arabs were convinced - or forced, depending on your PoV - to forfeit claiming their ancestral land in current-day Israel in exchange for the mere promise of being left alone in the WB, EJ and Gaza - a promise that successive Israeli governments have reneged on (and Palestinian governments have failed to deliver). I am well aware that there was a Jewish presence in Palestine throughout history. The logical response, however, is: so what? The Jewish community in Palestine, as you said, had no independent self-administration - i.e. lived pretty much like other religious and ethnic group lives (on a sidenote, do you consider Jews to be a distinct ethnic group?). So what is your argument here? That the hundreds or thousands of Jews who were in Palestine for that time acted as 'caretakers' of the ancient Kingdom(s?) and that a continued Jewish presence, small as it may be, means that the entirety of greater Israel remained the property of Jews? interesting story indeed. Assuming its veracity of course. So the Palestinian farmers couldn't prove that they exploited this parcel of land - still does not mean that its ownership befalls someone else. I find your presence and comments truly entertaining. Why are you so aggravated that we're talking, really? Afraid you might learn something that doesn't fit the dogmatic wonderland you live in? Given that whining seems to be the only thing you can do, I once again invite you to bugger off and let the adults have a talk. This said - yes, Jameel, Srugim 2.0! Be careful, Mo. If you keep doubting the veracity of my facts, I might doubt your veracity or even your existence. but that's it all! there has been a constant, continual presence of Jews, the only people (not an ethnic group) to behave that way, of all the occupiers who came to conquer. Say, aren't you Lisa's friend? Are you guys double-teaming again? Honestly I'm not sure whether I'm more disappointed at your tone or at your arguments. You're 'unofficial spokesperson', for heaven's sake! In any event, I'm afraid that after an email exchange with Jameel, it has been decided to end this conversation. it's been fun though, you're an interesting person, YMedad. "Maybe they'll claim next that they are an ancient and proud people." Not only that. But, they also had flying cars and cured cancer. Then Israel came and ruined everything. Don't you feel bad about purchasing land when you know the seller is going to have a hit placed on him / her? Yochanan: Usually, the sellers flees to a much more normal place right after the money is transferred. BTW - I felt awful about 12 years ago, when a Palestinian I was doing business with, was beaten up for doing business with a settler. I stopped cold-turkey. How about the 15 year old Arab kid who was killed by father and uncle who suspected he was a "collaborator". One of hundreds of Palestinian "collaborators" executed by their fellow Arabs in recent years.